As rumored, the big new device that's Palm's Jeff Hawkins has chosen to announce at the D conference today is the Palm Foleo, which the company is billing as a "mobile companion." 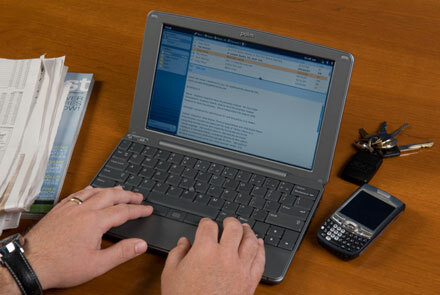 Boasting a 10-inch widescreen display and a full-size keyboard, the device is intended to be used in conjunction with your smartphone, with any edits to documents made on one device automatically reflected on the other thanks to the device's Bluetooth connectivity. The device also promises to turn on "instantly," boasts built-in WiFi, and should last about 5 hours on a single charge. The pricing and release info leaked out earlier also look to have been spot on, with it now officially set to be released sometime this summer for $500 (after a $100 mail-in rebate). We'll have plenty more pics of it shortly, but for now you can check out one more after the break.